Can you slam it past the keeper into the net? This game lets you volley your team to glory. 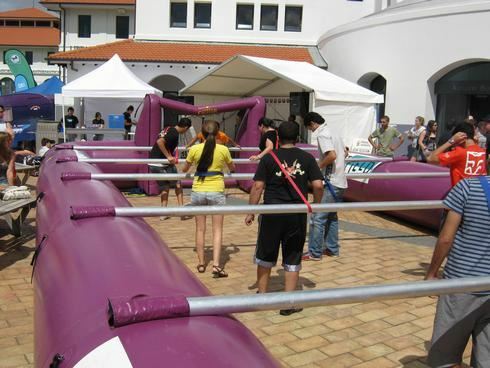 If you've ever enjoyed playing table soccer, have a go at adult sized Foozeball..! Table soccer, also known as table football, foozeball, foosball is a table-top game and sport that is loosely based on association football. 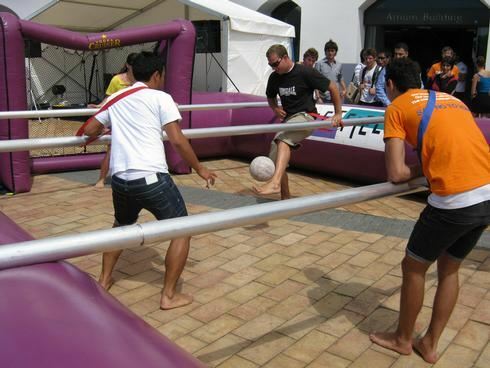 You can play your very own Foozeball world cup, Hilarious fun!!! In our version, teams of five strap their hands to a rail and become just like those little wooden people. Making you work as a team to score the goal. The arena is 11 metres x 9 metres, large enough for 10 players, and there are only three of these in New Zealand. Great outdoors or indoors (if your venue is large enough). For all ages. Requires a normal 3 pronged, single phase, power source, power drain 3-7amps (a petrol generator is available by prior arrangement at an additional charge). Minimum of 2 hours hireage applies, a 25% non-refundable deposit is required when making your booking. 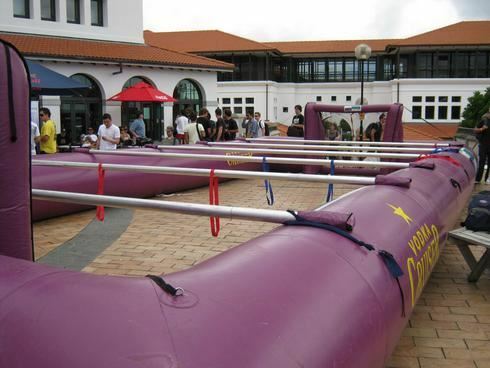 1x huge inflatable foozeball 'table'. 1x professional operator to run the Fooseball.